INTERVIEW WITH THE HARRY, ASTON AND LOUIS HERE! As far as Strictly Come Dancing spin off shows are concerned Rip It Up has been widely acclaimed as being one of the most exciting; with the winning combination of McFly drummer, Harry Judd, Olympian gymnast, Louis Smith MBE and JLS band member, Aston Merrygold all joining forces to become a sort of Strictly Contestant Boy Band of Dance. I'd say 'winner' as opposed to 'contestant' but of course we all know that Aston was robbed of the title - more of this later. After the success of last year's 1950s-themed tour the producers have caught on to this winning formula and added on a decade to showcase the music of the 60s with the boys, joined by backup dancers and a band, dancing through the hits of the generation that brought us Mersey Beat, Motown, West Coast, Mod and of course, Woodstock. 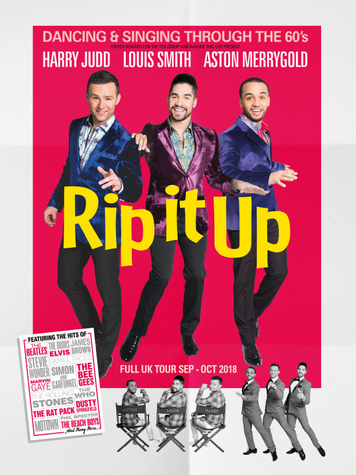 This show is a fabulous opportunity for the three boys to show off all their newly honed dancing skills and they certainly have some great moves, much to the delight of the packed out Southend Cliffs Pavilion audience, who were clearly massive fans of the boys. Harry, I would venture, probably got the loudest squeals but to be fair, Louis and Aston weren't far behind on the scream-o-meter! The dance routines in the first half took us through the differing music movements of the sixties with video excerpts from 60s songstress, Lulu, and - my favourite DJ of all time - Mr Tony Blackburn, giving us their version of events in a kind of musical history lesson of the decade. Here, the boys joined forces with the backup dancers and rocked, jived and boogied on down to the hits of the Rolling Stones, Dusty Springfield, The Foundations and The Archies. Highlights from Act 1 were Louis and his partner dancing to Stand By Me which drew the first really big applause of the night. Surprise of the night also came from Louis who had everyone open mouthed when he sang Let's Twist Again, in a set piece where Aston goes on to sing I Feel Good and Harry shows off his drumming skills to a Tina Turner medley. The second half is where things really get going and we have the boys showcasing their ballroom dancing skills with various partners. The Beatles section was a particular favourite, complete with psychedelic backdrop. Louis's routine to Are You Lonesome Tonight was another stand out performance. There's a little Q&A session where the boys get a chance to chat and where we get to commiserate with Aston on the fact that he got kicked out of Strictly perhaps a little too early and Harry reminds us that it's been seven years since he won the Strictly title - can it really be that long ago!? Aston gets to sing more in Act 2 and with Louis displaying his gymnastic pommel horse techniques and Harry playing the drums, we get to see the boys playing to all their strengths as well as wowing us with their amazing dance skills. It really is hard to believe that before Strictly Come Dancing none of them had any ballrooom dancing experience at all as they tango'd, foxtrotted and quick-stepped their way into the hearts of the audience with the music of Aretha Franklin, James Brown, Otis Redding, Ray Charles, Sam Cooke, Motown legends Marvin Gaye, Stevie Wonder and The Supremes, The Beach Boys, Simon & Garfunkel, The Byrds, The Doors, The Mamas & The Papas and Crosby, Stills, Nash & Young to name but a few, and ending the show on a high with the promise of returning next year for a Rip It Up 70s extravaganza!